What home maintenance tasks do you tackle every fall? The National Center for Healthy Housing has a great checklist of all kinds of necessary tasks around your house and when you should do them to keep your home in tip top shape. Guess which task you’re probably avoiding…. gutter cleaning! We all put off tasks we don’t particularly enjoy doing. I’m guessing not many people really enjoy getting on a precarious ladder and cleaning all the muck and leaves out of the gutters. Why do we even have gutters? 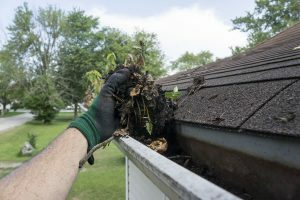 The purpose of gutters is to carry rainwater from your roof down the side of your home and safely away from the foundation where it could leak inside your home and potentially cause flooding or foundation problems. I’m sure you know that but sometimes we need to be reminded of the purpose of something to remember why it’s important to take care of it. This task really needs to be done at 3 times a year: once in the spring and twice in the fall. Why twice? Around here it can go from nice weather to icy in a day! So clean out the gutters before all the leaves have fallen then one more time when your trees are finished. If you wait till all the leaves are gone, you will run out of time. 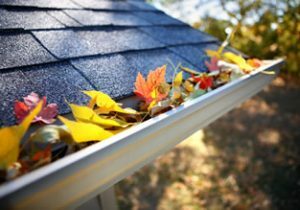 The next thing you know, you’ve got frozen leaves clogging the gutters! Gather gloves, dust mask, safety goggles, garden trowel, spade or gutter scoop, plastic bags, hose, ladder, someone to hold the ladder. DO NOT DO THIS ALONE! Stay on the ladder rather than trying to sit or stand on the roof. The risk of falling is less if you’re on the ladder. Start by putting the ladder close to a corner downspout…never more than an arm’s length away. With your hand or tool, clear out any debris clogging the downspout. Be careful that none of it goes down the spout. With the downspout cleared, any water that’s standing in the gutter will start moving out. When you fill a bag, tie it closed and drop it into the yard away from the ladder. Another option is to lay a tarp on the ground and just drop the debris down onto the tarp. Make your way around the entire house in this fashion. Be sure to check the brackets or hangers as you work your way around the house. You may need to tighten or replace hardware that’s broken, rusted or not working. Next, use the hose to rinse away any lingering debris. This will also help you make sure that there aren’t any clogs. If there are clogs, try using a plumber’s snake to free the debris. This is the time to look for leaks anywhere. If you find leaks, go back to them once the gutters are dry. Scrape off old caulk and clean the area. Fill small holes with a butyl-based gutter caulk from the inside of the gutter. I know you’re probably thinking “this is a lot of work”…and you’re right. But the truth is… Gutter prevention is measured in pennies; repairs are measured in dollars. If you can’t do this work yourself or you’re too busy right now to get it done before winter arrives, let us help. 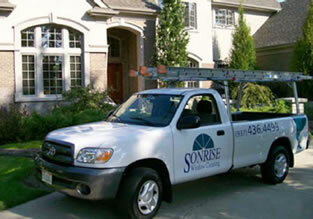 We do a great job cleaning gutters at a very reasonable rate of $75 an hour. Call today at 937-436-4499. 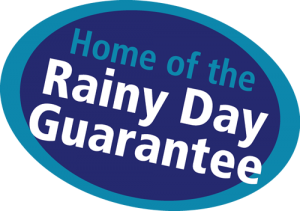 We also install Gutter Glove gutter guards, which can lessen the need for any gutter cleaning for years to come. Call us at 937-436-4499 for an estimate.